After a reasonable performance at Calder Vale and a long slow run over Winter Hill on Saturday morning I had almost nothing left in my legs and the Pike Race was a real struggle - over a minute slower each way than last year and although I picked up places descending I was still a minute quicker coming down last year. Ah well, my string of 5 consecutive PBs is ended - as it was bound to, someday. Allowing for Easter being so early and the missed weeks of training this is more a reminder of how much there is to do rather than a cause for panic. 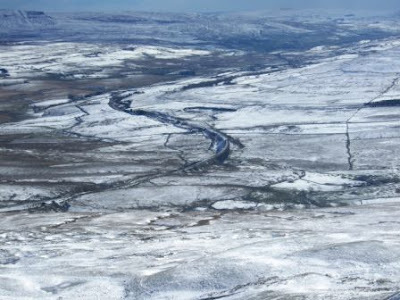 On Sunday we had a gentle run over Winter Hill and then went to tackle "Winter in The Dales" on Monday. The, sometimes fierce, snow showers were unexpected and the knee deep drifts were a surprise but in between the snow provided some fine running and spectacular photographs. 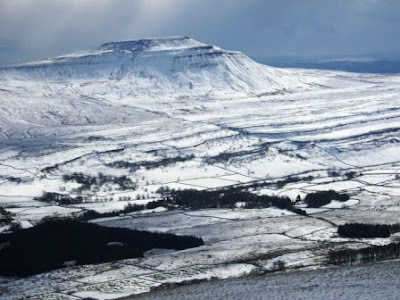 We had a long steady day over Ingleborough and Whernside to pick up another 18 miles and almost 4000 ft which seemed good enough to warrant a rest on Tuesday before a hilly twelve miles on Wednsday and a Hills session on Thursday for a second consecutive week with over 10,000 feet. Weather forecasts suggest a poor day on Saturday with Sunday being, perhaps, a little better. At the moment my plans are 'fluid' and will change with the weather with the intention of another 10,000+ feet and around 60 miles. 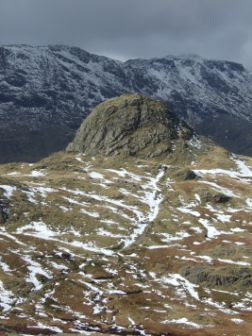 The first 'big' week for quite a while and after a long session on Winter Hill on Saturday we went to Great Langdale on a very cold Sunday intending to go over the Pikes before dropping to the bottom of Rossett Ghyl from Stake Pass and then on to Bowfell. 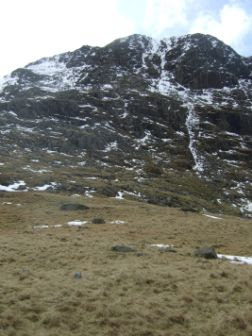 The fourth photo shows the area of the route up Bowfell but it fails to to show the wide, icy and difficult snow patches we encountered before reaching the flat ground below the summit after some diffuculties. This took so long we had to forgo the final climb over Pike O'Blisco after descending The Band. The rest of the week was spent on the road and a rest day on Thursday avoided some awful weather and on Friday we did the Calder Vale 10. A strong cold wind made things difficult and I was pleased to get my best place with a time just inside last year's while Pauline ran a PB on her first outing in Horwich colours. After Saturday just about anything was going to be better and easier and so it proved. On Sunday Pauline and I had an easy run over Winter Hill to Lead Mines Clough from Rivington (Google Earth Route) and that helped loosen, or gently stretch, my tight abductors and the weather was altogether better. Monday & Wednesday were just gentle recovery runs, each followed by assisted stretches to try to keep everything relaxed. Tuesday's track session was 300 m reps - one of my two favourite distances, the other being about 70 miles and it is only the distances in between I find difficult - in a pretty trying wind. My times were slow but nothing was too uncomfortable afterwards which is much more important. The M60 traffic prevented me getting to Horwich in time for the hill session and when I saw the rain, I wasn't too disappointed. Missing the session gave me an excuse to get out this morning before work and it was really good - what was left of the frost made it a little slippery under foot but it is good to watch the sky brightening and see the sun lighting up the fields - you could almost believe Spring is on the way. 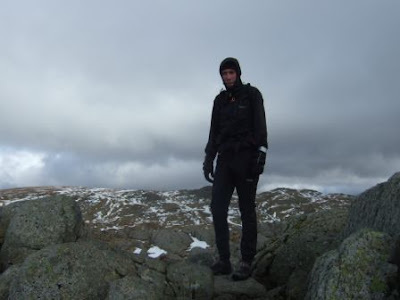 Saturday on Winter Hill and Sunday in the Lakes. 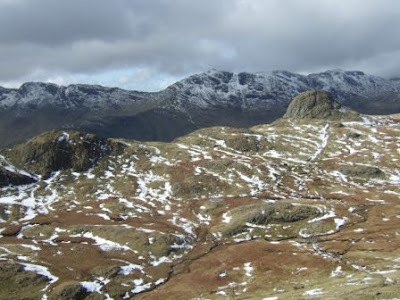 Weather looks as though it might be too poor for a recce but good enough for a "Great Langdale Roller Coaster" - about 13 miles and 7000 feet over the Langdale Pikes, Bowfell and Pike O'Blisco returning to the valley floor in between each. This will be an attempt to hit 10,000 feet and exceed 60 miles for the week. With Easter next weekend we are doing the Caldervale 10 on Friday so I may rest Thursday because Easter weekend looks pretty demanding. 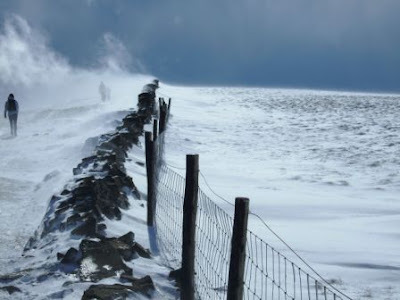 After last week's progress I was optimistic about a couple of runs on Winter Hill over the weekend - I didn't feel ready for a big run in the Lakes on Saturday and a family 18th birtday party on Saturday night meant an early start on Sunday seemed unlikely. The weather wasn't encouraging and the wind seemed vengeful - not strong enough to blow you over but cold and strength-sapping. My calf stood up to everything and my hamstrings seemed fine but my right abductor is still tight and uncomfortable. I met Ray (one of the runners I trained with for my 2006 BGR who occassionally features on Ed's Blog) just below the trig point and he cheered me up because I hadn't been enjoying it much until then. The morning turned into a long(ish) slow run that made begin to wonder about my fitness and doubt if there are enough weekends to get long days in the Lakes. Part way through the very tedious Scotland v England rubgy match I saw the sky over Aspull clearing and decided to go and test my legs again. Just four miles on the road through Blackrod, just enough to realise that apart from my slight groin strain my legs were fine and showed no effects from this morning's run (that could be a measure of just how slow it was, of course). This was also an opportunity to think about my training plan and to remember that my target date in June could be delayed by a couple of months. I also concluded, after much pondering, that I should give next weekend's Hobble a miss. Not because I couldn't get round but because it might make my groin worse but more significantly, if I do the Hobble on the Saturday I won't do much on Sunday and I need days in the Lakes. I am still on schedule go get over 110,000 by mid-June in the weather allows so I think I need to start taking every opportunity, starting next weekend. 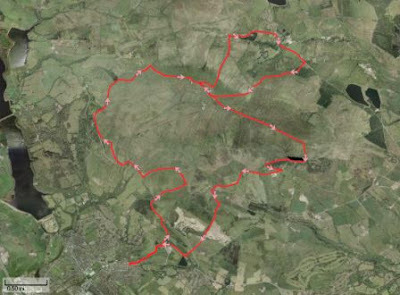 If you have Google Earth you can have a look at the route (use 'Tools Play Tour' to fly along it). Otherwise the picture above will give you some idea of where I went. More difficult week than expected. Saturday was terrible - I didn't enjoy it at all and this was made worse because I had looked forward to it for so long and then it was made even worse because I didn't enjoy it at all. By lunchtime I was wondering if I would ever enjoy running again and when Pauline came home from her run over Winter Hill so full of joie de vivre I felt even worse. Sunday was much better and it was good to be out again. Monday was just a gentle leg stretch and a massage to try loosen my, still tight, hamstrings. A tentative, 'sensible' track session on Tuesday more or less confirmed that while my calf is still tight all but the very last traces of the strain have gone. A number of people asked how my calf was and Gaynor asked "How was your first run, I bet you hated it?" and then said "You just wanted it to be over and know your calf was OK. It is always the same, the first one, it is terrible." I hadn't realised. This was the first time I had rested with an injury that I couldn't really feel getting better and that I wouldn't know if it was OK until I ran on it and as I ran on it every other muscle in the rest of my legs protested and tightened up. So thank you Gaynor, I felt so much better on Tuesday. Another gentle recovery run on Wednesday and then I warmed up, somewhat nervously, for last night's hill session. I reached the point where I needed to start pushing a little harder but, obviously, without doing any damage. Long reps on Chorley Road was the session and a good one because the incline varies the reps are long enough to be able to either pushing on or hold back. Starting gently and pushing a little harder on each one without every hitting 100% was the plan and it seemed to work. My best for the final rep is 5:03 and last night I managed 5:13 and my calf felt better for being pushed with only a very little residual tightness afterwards. No targets again but a couple of runs over Winter Hill on Saturday and Sunday and if the improvement continues I'll be looking forward to the Haworth Hobble on the 15th. Back to Winter Hill, with Pauline, after three weeks and despite the wind and tight legs (from yesterday?) it was really good to be out and enjoying the sunshine and views. Yesterday's blister developed more than I would have liked with peat and Pennine grit ensured a black, bleeding hole in the top of my foot - sorry I have just finished reading Dean Karnazes' "Ultra Marathon Man" which is big on the details of suffering but I'll be over it by tomorrow. Something very gentle tomorrow - an extended warm up essentially - before a massage to improve recovery from these two outings. The Howarth Hobble remains my next target; no longer as measure of winter training rather a long steady training run to measure recovery.